Now that cookout season is upon us, it’s time to make up a quick and healthy batch of Celery Root Coleslaw. I know most people have never made a root vegetable coleslaw. But why not try it? It’s a nice change from the usual cabbage coleslaw everyone brings to parties. And so much better for you. Plus, it’s vegan, allergen free (except for soy) and healthier than the coleslaw you get at the store. I originally came across this celery root recipe in Diabetes Forecast, a magazine put out the American Diabetes Association. It was a recipe for Celery Root Salad by my friend, Robyn Webb. I loved the ingredients and found the photograph so inspiring. However, going over the recipe, I found a few things I needed to change. First, I couldn’t eat it due to my food sensitivity to sour cream. Since, I wanted more of a “bite” to the celery root salad recipe sauce and felt adding some rice vinegar and ground chipotle chile pepper instead of cayenne would do the trick. Then, I wanted to add more carrot for sweetness and color. 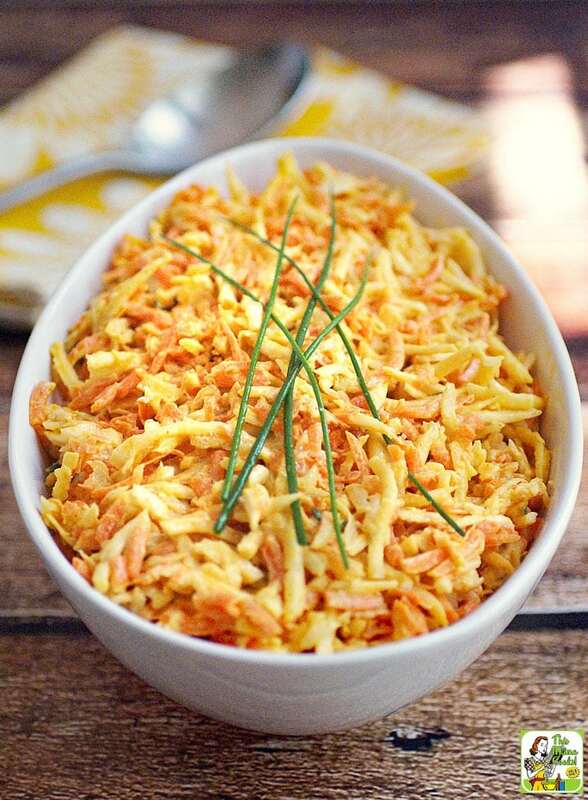 In addition to all my recipe changes, I wanted to make this celery root slaw recipe as allergen friendly as possible – gluten free, egg free, dairy free, and so on. Obviously, celery root and carrots are fine, but it was the celery root salad recipe sauce that was the challenge. To do this I used a vegan mayonnaise and Tofutti Sour Cream. In addition, I used gluten free rice vinegar like NAKANO Natural Rice Vinegar. 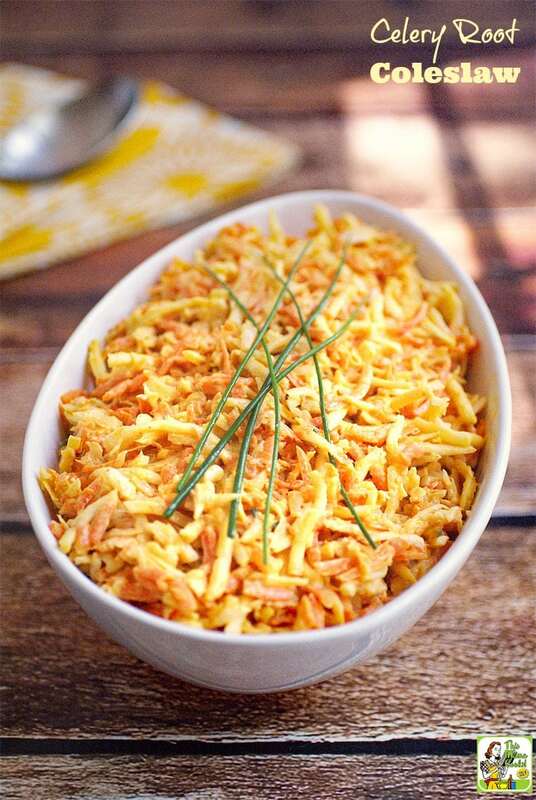 Celery Root Coleslaw is naturally nut free, of course. However, this vegetarian and vegan slaw salad is not soy free. That was one allergen I couldn't avoid. Celery root is rather tough to grate – too tough for a box grater. I recommend using a food processor to shred it. Using a good food processor for the fennel and carrots will make things much quicker and easier, too. While Celery Root Coleslaw is a great on it’s own, I like serving it up in a brown rice tortilla wrap. But the best way to enjoy it is with grilled fish tacos with some avocados and salsa – delicious! Looking for another side salad? Try The Salty Side Dish's Carrot Salad with Raisins and Pineapple. 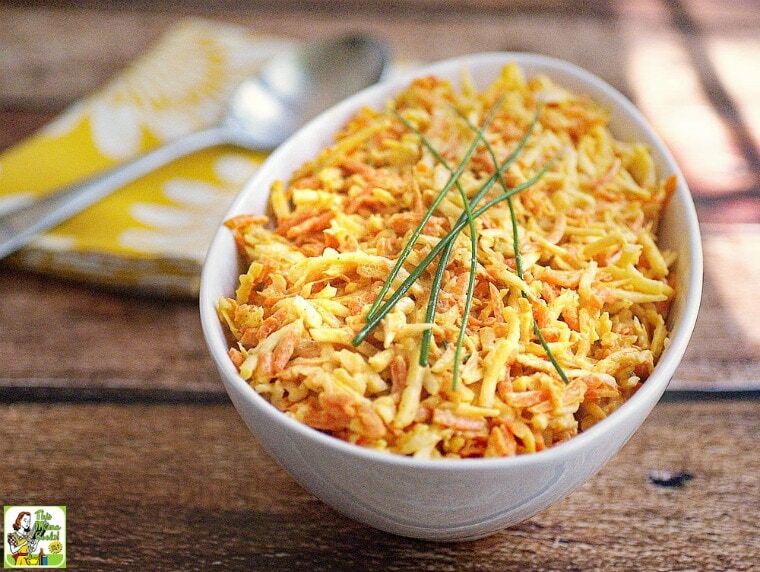 In a large serving bowl, combine the shredded celery root , fennel, and carrots. Toss well, then add the lemon juice and toss again. While tossing, pick out any large pieces of vegetables that weren’t shredded by your food processor. 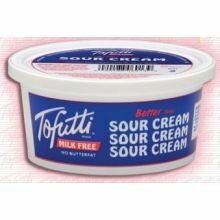 In a small bowl, gently whisk together Tofutti sour cream, mayonnaise, spicy mustard, olive oil, rice vinegar, sea salt, black pepper, and ground chipotle chile pepper. Fold the minced green onions and chives into the Tofutti dressing. Add the coleslaw dressing to the celery root slaw salad and toss well. Cover with a lid or plastic wrap, and refrigerate for 20 to 30 minutes before serving. Garnish slaw salad with whole chives, if desired. Originally published on September 12, 2013. Updated with new pictures and information. Your salad looks and sounds fantastic! I would share it with my husband’s family here due to the large amount. I know what you mean with using up the whole bulb, so more quantity definitely makes sense here. Thank you for sharing your gorgeous salad. I’m STILL eating that salad two weeks after making it! It’s held up very well.